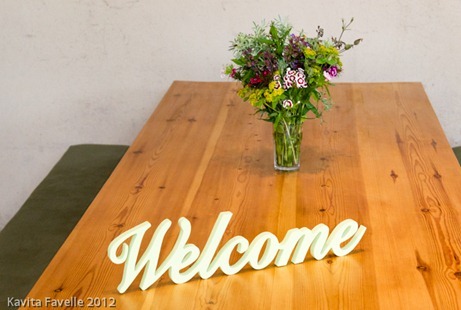 The welcome at the Riverford Organic Farms Field Kitchen is warm. Guests are shown to their spot at large communal tables serried beneath a vast curving roof. Huge windows let in plenty of light during our June lunch-time visit. The menu is no-choice, served family style at a fixed time, so there’s a real sense of buzz as everyone arrives and waits eagerly for service to begin. Whether you come for lunch or dinner, the menu is designed to show off the organic vegetables for which Riverford is known. There is one meat dish, but amongst the five colourful vegetable dishes, it’s simply one more taste and texture rather than the star of the show, as is more often the case elsewhere. This is, of course, by design, as head chef Rob Andrew tells us during an interview before lunch. Rob joined Riverford in 2010 to head up the Travelling Field Kitchen, which toured the UK with its giant yurt, bringing some of the Devon Field Kitchen experience to diners further afield. When former Riverford head chef Jane Baxter left the team earlier this year (to work with Henry Dimbleby on Leon’s next cookbook) Rob stepped into the head chef role in the Wash Farm Field Kitchen. From the beginning, Riverford Customer Service received many calls from customers seeking advice on what to do with some of the less familiar items they found in their boxes plus fresh ideas for the more prosaic contents. The Field Kitchen started a a way of showing people what they could do to make the most of their produce; it also lead to the vegetable cookery books written by Jane Baxter and Riverford’s owner Guy Watson. Today, that’s still how they work, creating menus based on the contents of the current boxes. Rob explains that the farm team deliver pre-pick test boxes about a week ahead, and the kitchen team use these to trial and develop the dishes they’ll serve the following week. He admits that the main farm teams refer to his gang as “fridge rats” as they’re always heading over to the stores to see what they can find to take back to the kitchen and experiment with. 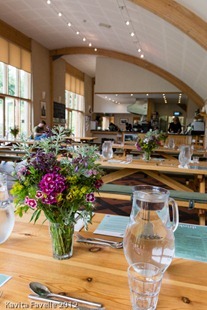 The Kitchen is located on Wash Farm, the original home of Riverford. Since then, the company has purchased additional farms in the area to meet demand from a growing customer base. It has also forged partnerships to create the South Devon Organic Producers (SDOP) cooperative, a group of farmers who’ve converted some of all of their lands to grow organic produce to be sold by Riverford. Riverford have also purchased farms in France, to better cover the hungry gap when our local weather and lack of light makes growing hard work. They do import some produce from Spain, bringing it over by road rather than air, and can pass by their farms in France on the same route. The meat and dairy is also sourced locally, from farms within a handful of miles of the Field Kitchen. And the beers and soft drinks on offer are, of course, from local producers. On the day of our visit, lunch is a a dish of slow cooked lamb over griddled leeks and butter beans, carrots with mustard and honey, spring greens with red onion and raisins, roasted beetroot with pistachio, orange and feta cheese, new potatoes with rosemary, fresh garlic and lemon, and the most fabulous salad of chargrilled courgettes, asparagus, broad bean and little gem salad. For vegetarians, the lamb is substituted with roasted red peppers stuffed with tomatoes, garlic, basil and ricotta. 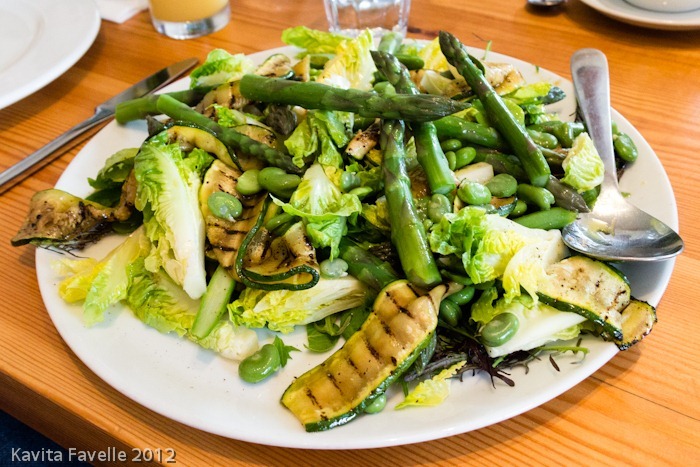 The chargrilled courgettes, asparagus, broad bean and little gem salad is by far and away my favourite dish and I would happily feast on this dish alone and be completely satisfied. 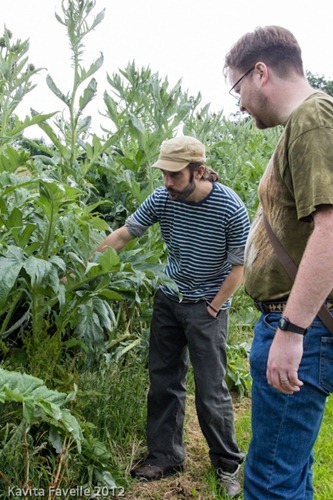 After lunch, Rob takes us outside to show us a row of cardoon plants (also known as artichoke whistles), a passion of owner Guy Watson, along with globe artichokes, which we spot in a nearby field. Apparently, cardoon needs to be forced like rhubarb, so that it grows thin, tender stalks rather than heavy wooden ones. The bitterness is not to everyone’s taste. Another of Guy’s enthusiasms has made it into both boxes and the kitchen. During a brief chat with Guy during lunch, he tells us that whilst former head chef Jane Baxter wasn’t such a fan, Rob is happy to use broad bean tops, which are picked anyway, when the farmers thin out the broad beans. Like pea shoots, the flavour is reminiscent of the beans themselves. A good tip for those of us harvesting our own crops from gardens and allotments. Whilst the savoury dishes are brought to the table, dessert is served at the kitchen end of the room, with tables invited to go up in turn and choose a dessert from the array on offer. 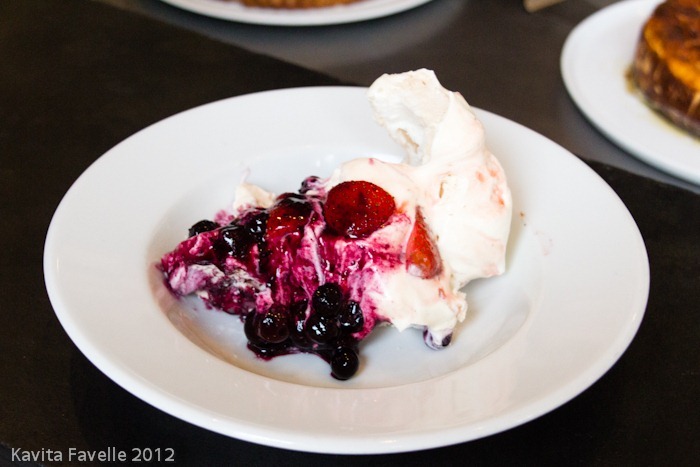 Torn between pavlovas, lemon tart, cheesecakes, chocolate cakes and sticky toffee pudding, it’s not an easy choice, but again, all of the ones we try within our group are deemed absolutely excellent. For £19.90 per person (£9.95 for children aged 3 – 12) you’ll enjoy a substantial, delicious and inspiring meal. In the evenings, the price tag of £26.50 / £13.25 includes a starter as well as the main and dessert we had for lunch. After lunch, we were kindly given a private tour around the farm by Penny Hemming, an experienced horticulturalist who now cultivates organic cut flowers and runs farm tours for Riverford. She also planted up the beautiful culinary and medicinal herb garden just outside the Field Kitchen and she writes their gardening blog, here. Because of the time of year, and also the ease of access to different parts of the farm, our visit was heavy on the polytunnels, though Penny explained that only 2% of what they produce is grown under cover. It was a fascinating tour, lead by a passionate and witty guide, and we thoroughly enjoyed it. We finished with a visit to the Farm Shop, full of tempting goodies. 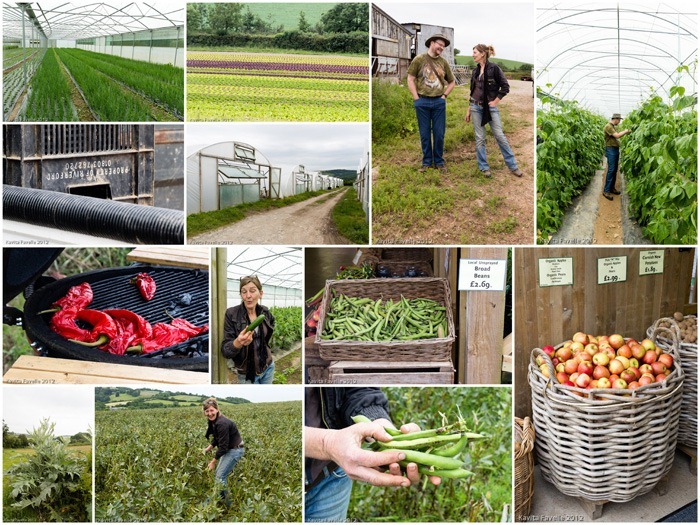 Our visit to Riverford was part of a week-long South West Tour courtesy of The Food Travel Company (and Riverford Organic Farms). They are a new company offering specialist trips for food (and drink) lovers, with group departures and customised itineraries available. Our trip included a night near Buckfastliegh, four nights in Cornwall and another night in Bristol on the way home. I’ll be posting about several more of our experiences in coming weeks. 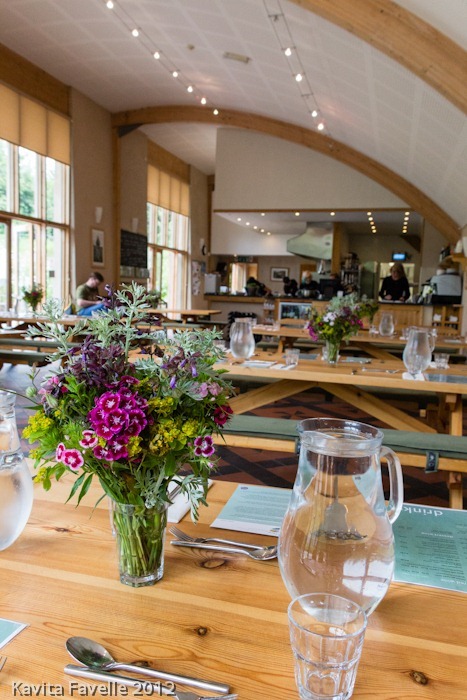 3 Comments to "Riverford Organic Field Kitchen & Farm Tour"
Jealous, I love Riverford and when my parents visited last year I insisted on going there for lunch. Dad thinks it was the best meal he has ever eaten. I’d love to go back. Hi Sarah – a glowing review from your Dad! 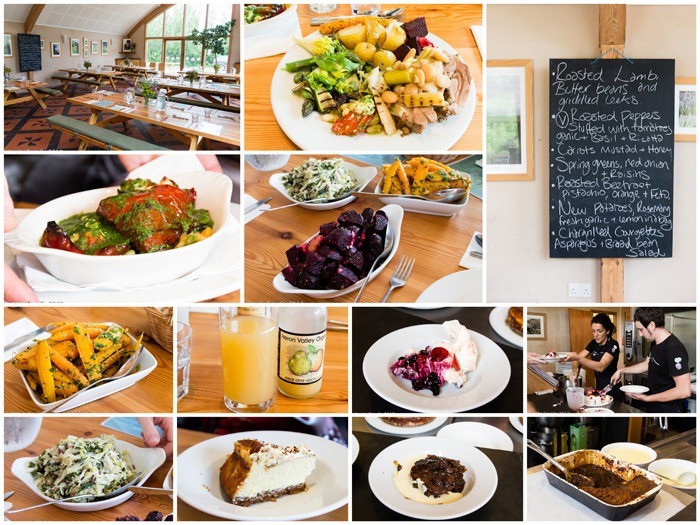 Really glad you enjoyed your meal at our Riverford Field Kitchen, can you remember any of the stand out dishes you had?